MCLENDON-CHISHOLM, TX, DECEMBER 12, 2017 — Tonight, the McLendon-Chisholm [M-C] City Council ratified a contract for fire service with the McLendon-Chisholm Volunteer Fire Department [MCVFD] that adopts the third of three non-negotiable options presented by Fire Chief Robert Jones after reneging on face-to-face negotiations in October. Presented as an ultimatum, the three choices were to either (1) continue with the current funding, (2) increase funding to add Sunday 7am-7pm for the station to be manned, or (3) return to an all-volunteer fire service. The MCVFD also receives a significant amount of grant funding from the State to supplement the cost of training and equipment, all of which is approved to serve the entire fire district, without distinction to city/unincorporated area boundaries. As part of an overall review process set out by the Mayor in his June 27 State of the City Address, the M-C City Council has been reviewing all contracts and meeting with service providers. “The Council has renegotiated several contracts,” stated Steinhagen, “that have cut costs to the City, increased revenue significantly, and improved ‘customer service’ for our citizens. This has made it possible for us to take a significant chunk out of our city hall building debt to save taxpayers more than three hundred thousand as well as cutting the tax rate to a flat 0.15 cents,” he added. Council Member Turnbull focused on the cumulative data gathered by Council Members and City staff that challenges the legitimacy of a career fire department for cities with populations, like M-C, under 2,600. 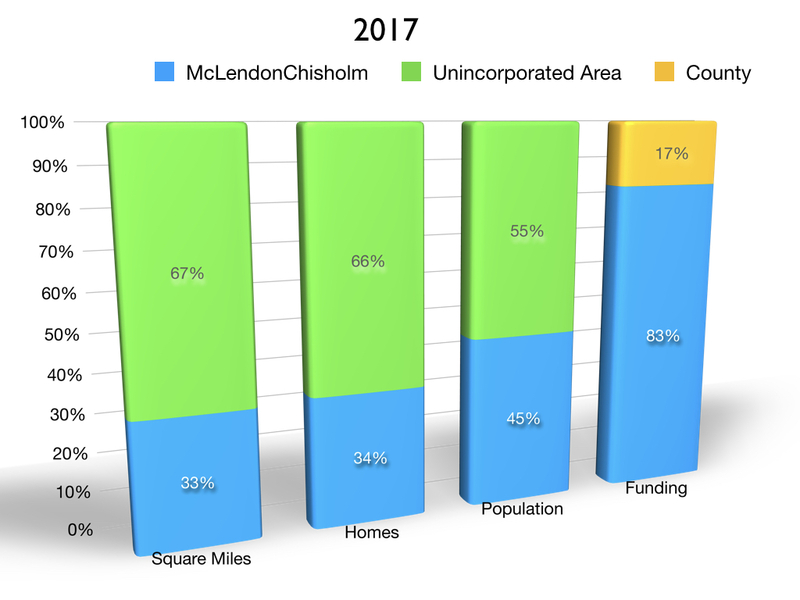 Plans are underway in RC to transition into a Hybrid department (part full-time and part volunteer) that is similar to Rockwall’s, as they grow closer to fifteen thousand in population, which may happen in two or three years, but only after more infrastructure is in place along with a possible tax-hike for a bond to pay for all of it. Steinhagen added, “We would never have considered the comparison to RC, which has a truly outstanding all-volunteer fire department that serves a city six-times the size of M-C, had the Fire Chief not done so during his October 10 presentation (view video below) in an attempt to convince the City Council that we are falling short of the standards of other cities. However, he clearly didn’t take a close enough look at the fact that fire department funding was essentially equal.” concluded Steinhagen. “I’ve said all along that I think we’ve been paying too much for this service,” said Council Member Sim Woodham. “I just can’t reconcile why funding has increased from $23,000 to $320,650 in just four years, which amounts to 25% of our city’s budget,” he said. Mayor Pro Tem Wayne Orchard was the sole opposition to Turnbull’s motion, preferring instead an “enhanced services” contract where the station would be manned 12 hours a day with two firefighters. As the designated liaison between the Council and the MCVFD, Orchard also proposed elevating qualification standards for the paid firefighters that would staff the station, which at a minimum would have required certifications in both (1) the “Basic Certification Level” from the Texas Commission on Fire Protection [TCFP] and (2) either (a.) an Emergency Medical Technician [EMT] or (b.) paramedic, standards which were not included in the MCVFD’s contract proposal. Echoing her concern, Herren asserted that other all-volunteer departments are obviously able to find people who can remain in-district during times when the MCVFD is paying firefighters to man the station. “To me, it’s a question of leadership,” said Herren. “RC’s fire department is successful in attracting excellent volunteers between 7 am and 7 pm because they have a fire chief who is a leader that people want to follow, which is the kind of leader we will strive to hire for our City-owned FD,” he concluded. While no time or attention was paid to have an objective assessment of the current and future needs for City fire protection, the Council embraced the fire chief’s “solution;” a six-year timeline of substantial funding increases to the to transition the MCVFD into the City, which goes to build the fire department. However that all changed last month when Chief Jones announced that the eleven-member MCVFD had voted both to suspend their 6-year timeline and rescind plans to transition into the City. While the MCVFD’s sudden decision to withdraw from their commitment to integrating into the City was a monumental turning point for contract considerations, Mayor Steinhagen highlights two prior events over the last two months that he describes as “game changers,” which prompted added scrutiny by the Council. 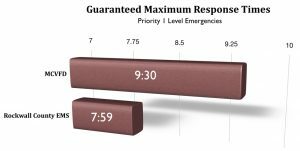 The first occurred on October 1 when the new contract with the Rockwall County EMS [RC-EMS] (ambulance service) went into effect, which drastically improves the guaranteed maximum response time for critical “Priority 1” calls from 10:59 minutes to 7:59. 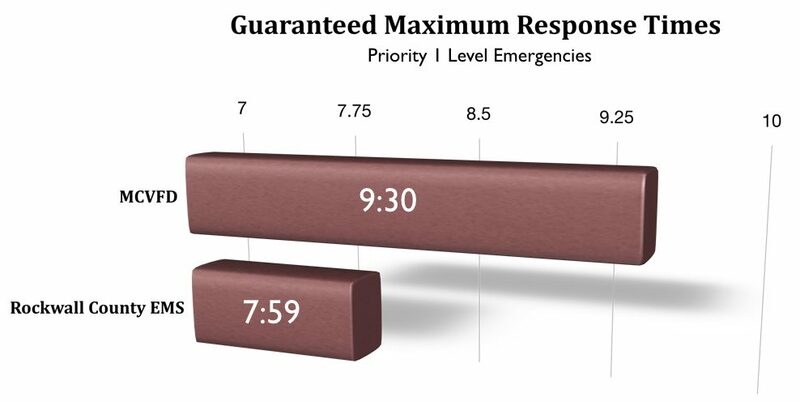 Before October, the RC-EMS’ guaranteed response time was effectively 11 minutes but included no means of enforcement when they missed that standard. The new contract, which requires an 8-minute maximum (effectively) comes with significant financial penalties for missing that standard, which puts the EMS ahead of the MCVFD by a full minute and a half. Well over half of MCVFD’s calls have been EMS-related, which is one reason why the Council gave added scrutiny to the MCVFD’s proposed contract, which made no accommodation to this substantial change and included no measures for the City to enforce their proposed response time standards. However, the MCVFD’s proposed 2018 contract stipulates a 9:30 maximum response rate, which Steinhagen added, “includes no means of enforceability and no qualification standards for the firefighters beyond basic first aid. Essentially,” Steinhagen continued, “if we were to sign the MCVFD’s proposed contract we would be paying to guarantee that a minute and a half after paramedics are on the scene, two firefighters with basic first aid skills would arrive to assist. There is no justification to continue with the same contract when the overwhelming majority of medical calls are being handled more effectively and efficiently by RC-EMS,” Steinhagen said. In light of RC-EMS’s new response standards, Council Member Herren presented the Council with research of local, state and national data, which ultimately questions the legitimacy of the MCVFD’s growth strategy, where the cost per call has skyrocketed to an average of $1,600. “I question the wisdom of the MCVFD trying to tackle non-emergency related calls in a city our size,” said Herren. Council Member Balkum views the requirement-mindset that has resulted in the MCVFD’s push for career firefighters as the product of “necessity by design.” “When I look at the number of calls that the MCVFD is trying to answer that are not real emergencies,” says Balkum, “like vehicle lock-outs and minor vehicle accidents, which accounts for a large portion of their call volume, it becomes apparent that they are more of a compensated public service contractor than an emergency services squad.” She adds, “The only people who could possibly volunteer would be those who don’t have another job or retirees. It’s a system that’s designed to push volunteers away,” Balkum concludes. The second “game changer” occurred last month when the Rockwall County Commissioners Court accommodated the fire chief’s request to cease contracting with the City and instead contract directly with the MCVFD. Since 2016, Steinhagen had been advocating for the MCVFD to find ways for those in the unincorporated area of the fire district to begin contributing to their own fire safety, where currently they contribute nothing, since the City’s contribution accounts for 83% of their budget and the funds paid to supplement the remaining 17% comes from sales taxes collected in the unincorporated areas of the County. 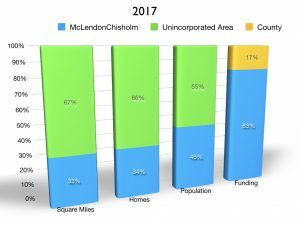 This chart compares the land mass, the number of homes and population between the City and the unincorporated area of Fire District 22, for which the MCVFD is responsible, to the disparity in 2017 funding where 83% comes from M-C taxpayers. Had the City Council approved the MCVFD’s proposed contract for 2018, the disparity would have placed even more of a burden on M-C taxpayers while those in the unincorporated area continue to contribute nothing. Citing concern about the inevitability expressed by at least two County Commissioners that the current annual subsidy granted by them will be repurposed to other areas of public safety that will benefit a greater number of citizens throughout the county, Steinhagen has pressed for the MCVFD to be proactive and creative in helping to ensure that funding for the public safety of those in the unincorporated area would not be at risk when that day comes. In June of 2016, Steinhagen, who consults not-for-profit organizations for a living, proposed a fundraising program for the MCVFD that has provided other cities with long-term and sustainable income. In addition to his time and expertise, he offered to give $10,000 to cover administrative costs to start and maintain the program. As a civil servant in another city, Council Member Woodham takes issue with the pushback he’s witnessed by the MCVFD’s leadership. “Though he’s never been a full-time firefighter and, until four years ago, never run a fire department, the chief accused us of micro-managing when we questioned some of his decisions,” said Woodham. Citing concern for the safety of firefighters that are under Jones’ command, Steinhagen has also revealed that the Council has been unable to authenticate the Chief’s credentials. During the October 10 meeting, the Council was informed that [Lieutenant Herman Larkin] was the only non-probationary member of the MCVFD that is not certified under the Texas Commission on Fire Prevention [TCFP] (View Video Below). However, a search of the online TCFP database for certifications held by Fire Chief Robert Jones came up empty; the only certifications for the fire chief that can be verified are “Fire Fighter I & II, Driver/Operator, & Wildland Fire Fighting,” with the State Firefighters and Fire Marshall’s Association [SFFMA], which are not the equivalent of but a qualification to test for basic level TCFP certification, and an Emergency Care Attendant [ECA] certification by the Texas Department of State Health Services. There is also no evidence that the Fire Chief holds any of SFFMA certifications for Fire Officer I, II, III, or IV. Steinhagen further stipulates that when the MCVFD members agreed to the terms of the contract with the Commissioners to cover the unincorporated area of the fire district, which makes up two-thirds of the land mass, more than half its population and has accounted for well over half of MCVFD’s call volume, the true cost of fire service in the fire district was reestablished. Those who made the decision to dive headfirst into monumental funding increases to the fire service contractor did so without the feedback, contribution, knowledge or consent of the taxpayers that were to become obligated to it. It’s consistent with the many other actions that they took, including putting the people into debt for $2.125 million to build a 5,000sqft city hall building without the knowledge or consent of the people. The real problem back then was the big-government, top-down mindset of the former Mayor and the narrow majority that made up the City Council where the solution to every challenge was always a matter of more taxpayer funding. If you’re a hammer then everything you see is a nail, and if your a liberal then every problem you see can be solved with more government funding, which is why they proposed a 330% budget increase and a 228% tax hike that motivated me to lead the successful tax-rollback referendum that catapulted me into office. During tonight’s City Council meeting, some of the very same people that got us into this mess and their supporters have come back to advocate for us to turn a deaf ear to the facts and continue increased and unobstructed taxpayer funding to the MCVFD. In essence, they wanted us to double down on their bad decisions. Our saving grace is that this problem is still fixable and we have a Council with the resolve to stand-up to the ousted political ruling class that, as we witnessed tonight, has reorganized in hopes of thwarting our efforts to bring fiscal responsibility and creative bottom-up solutions to our community. We will act deliberately to ensure that the actions we take to establish and create a city-governed and accountable fire department is grounded on a strategic plan that meets the needs of our citizens now and in the future. Speaking in support of his motion, which the City would guarantee quarterly payments of $8,437.50 for thirty-three months, Council Member Turnbull proposed setting aside the remainder of the City’s budgeted allocation for fire safety, which he calculates as $813,450 over the life of the contract, to either fund a city-governed fire department, pay down the city hall building debt, or both. Since October, Council Member Balkum has been leading the Council to evaluate the fire-safety needs of the City by consulting with fire safety experts in planning and developing a city governed fire department. She has also opened an opportunity for citizens to be part of a committee to help advise the Council through the process of next steps. Steinhagen also expects a new fire chief to be driven to equip citizens where the mindset of the community in times of emergencies is not solely focused on first-responders, but on one another. “Next year we will begin holding free CPR classes for our citizens,” says Steinhagen. “I am also advocating the canvassing of our neighborhoods and rural homesteads to educate and remind citizens about the importance of having and regularly checking working smoke detectors since, according to the National Fire Safety Association, they have saved more lives than all the fire departments in the US combined,” he added. During this morning’s regular meeting, the County Commissioners reaffirmed that the mutual aid agreement, signed in 2011 between Rockwall County, the cities of Rockwall, Heath, Royse City, Fate, McLendon-Chisholm, Rowlett and also the MCVFD, remains in full effect. Since the MCVFD continues to serve the entire fire district, mutual aid will continue to be truly mutual between cities. Despite desperate assertions to the contrary, Council Member Herren highlighted that the city’s current ISO rating of 4, which can help lower some homeowner insurance rates, should not be impacted since the rating was achieved four years ago when the department was still all-volunteer. UPDATE: The signed contract by the Mayor was hand-delivered on Wednesday, December 13, 2017, at 9:50 am to the MCVFD (received by Lieutenant Herman Larkin) for review and acceptance. UPDATE: Acknowledgement of the MCVFD’s receipt of the contract was received by the Mayor on December 15, 2017, at 4:13 pm. « What’s MCVFD Leadership Trying to Hide?